Mavis is currently the City License Collector and is running for re-election. OBS supported Mavis for Circuit Clerk because she met our endorsement criteria. Her public service extends beyond her office and she has always been active in the community. Mavis has the distinction of being the first African American woman to serve in two city-wide offices. She has done an exemplary job in her elected positions and brought no scandal to those offices. She is an attorney and has a nursing degree. Mavis has always been supportive of OBS and our work as well as other black groups working for the positive health and well-being of our community. Visit her website. Kevin is running for representative of the 85th District. This seat held by Clem Smith who is term-limited. We first became acquainted with Kevin through the Freedom Garden as a young, energetic volunteer. He returned to St. Louis after a short stint with Senator Claire McCaskill, wanting to make a greater commitment to his community and began exploring where he could best make a difference. Kevin grew up in Hillsboro and has family in various North County municipalities that are included in the district. Visit his website. 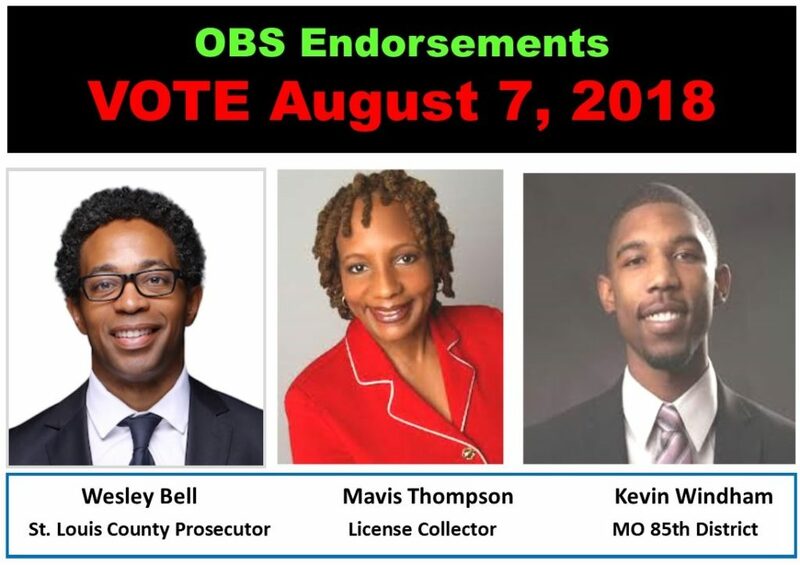 Wesley is running for St. Louis County Prosecutor. He is currently a council person in Ferguson.Bell is the only African American to declare his candidacy. He has been a practicing attorney for about 20 years and has served as a judge and prosecutor in North County municipalities. Those positions became controversial when the expose of exploitive practices by municipal courts happened post-Ferguson Uprising. Wesley says that his approach was to always find alternatives to court fines and jail. His platform for judicial reform is consistent with OBS’s platform. Wesley has endorsed our Black Jurors Matter Campaign. Visit his website.